NIDA/SAMHSA/ATTC Blending Team members design and disseminate products that give substance use disorder (SUD) treatment providers the necessary tools to facilitate the adoption of science-based interventions in their communities. 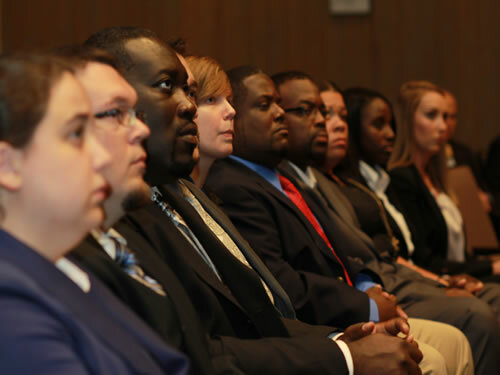 The following are one-day training events that are designed specifically for the criminal justice workforce. An adaptation of the NIDA/SAMHSA blending product: Treatment Planning MATRS curriculum using criminogenic risk assessment tools, [i.e. Ohio Risk Assessment System (ORAS), Level of Service Inventory-Revised (LSI-R), and the Federal Post Conviction Risk Assessment (PCRA),] to identify treatment needs and barriers of the criminal justice population with SUDs. This training combines an evidence-based criminogenic risk assessment with an evidence-based treatment planning curriculum in order to help SUD treatment providers and case management personnel work more effectively with offender and community re-entry populations. This course is based on the Blending Team Product: Promoting Awareness of Motivational Incentives, a package of tools and training resources that introduce the principles and evidence base behind the clinical use of motivational incentives. This adaptation combines that original work with the collective work of NIDA, SAMHSA, the National Institute of Corrections, and the experience of corrections professionals. Participants will learn a blueprint for the development of science-based behavioral management programs specifically designed for the criminal justice involved population. · following release, there is high incidence of a return to opioid use with serious impact for health, public safety, communicable disease, and return to prison. · Phase 1: MI: Engaging to Facilitate Change. A credited, self-directed on-line course on MI. · Phase 3: MI Assessment: Supervisory Tools for Enhancing Proficiency (MIA: STEP). A two day credited training that provides concrete tools and practice for clinical supervisors who supervise or mentor treatment providers to enhance their MI skills. To complement the series above, web based consultation and learning collaborative facilitation is provided for a period of 6 months. Web based consultation sessions will occur once per month during one hour video/audio interactive meetings.